Safety | Mark Sloan M.D. People who take care of young shooting victims rarely talk publicly about what they see and experience. As a result, the debate about gun violence is often theoretical, numbers-driven, and prone to strident sloganeering. What actually happens is buried in euphemism: 20 first graders “die” at Sandy Hook, dozens of young children and teens are “killed” in one grim Chicago year, and so on. We don’t see the damage that bullets cause to young bodies, or watch as their lives slowly ebb away, as so many first responders and ER workers do. And so we remain one step removed from the reality of what guns can do–are doing–to our children. Newman offers no solution to this epidemic, but points out the fallacy of many pro-gun arguments. Keeping a gun in the home for protection? A family member is 18 times more likely to die in that house than is an intruder. Sally Cox, a school nurse in Newtown, told Scott Pelley of “60 Minutes” that when state troopers led her out of the school after the mass shooting they instructed her to cover her eyes. This was humane, and right. But some of us see every day what no one should, ever. If the carnage remains undiscussed, we risk complacency about an American epidemic — one that is profoundly difficult, but necessary, to watch, and to confront. That is why I bear witness. Notice that none of these weapons (including the Howitzer) carried more than a half-dozen or so bullets or cartridges. It’s not that weapons with higher killing power didn’t exist in 1968. We were in the thick of the Vietnam War, after all, with its profusion of pistols, rifles, submachine guns, and the like. But nobody expected to see those weapons out on the street here at home. Things hadn’t really changed all that much between 1776 and 1968, gun-wise. Whether you were firing your single-shot musket at the British or your “Saturday Night Special” in the middle of a 1960s bar fight, you very quickly ran out of ammunition and were forced to reload. Not so today, when the AR-15 used by the Newtown shooter reportedly had a 100-round magazine. I was a sophomore in high school in 1968. Had someone opened fire in our lunch-time cafeteria, he might have hit a few of us before having to reload and probably being overpowered. In 2012 he could easily wipe out the whole place. My brother, John Henry Sloan M.D., was the lead author of a 1988 study in the New England Journal of Medicine that compared Seattle and Vancouver, British Columbia, in terms of rates of specific crimes and, in particular, homicide due to handguns. The two cities were chosen because of their closeness (140 miles), similar demographics, and dramatically different handgun regulations–Vancouver’s laws being far more restrictive. The study found little difference between the two cities in rates of simple assault, robbery, and burglary. It did find, though, that residents of Seattle were more likely to be victims of homicide, and that the excess risk was entirely due to a 4.8-fold increase in the risk of death by handgun. There was no difference in homicide by any other method. Their conclusion: “Restricting access to handguns may reduce the rate of homicide in a community.” Wise words that have fallen on politically deaf ears here in the U.S. ever since. I wrote this essay twelve years ago, and I hadn’t thought of it in a long time. Then came this morning, and the news of the school shooting in Connecticut. I hunker down, crawl in next to him and find myself face to face with an electrical outlet cover, a leftover from the days when my children couldn’t be trusted not to zap themselves curly-headed with an ill-placed paper clip or a drool-coated thumb. I pry the round hunk of plastic from the wall and hand it to John, explaining what it was used for back in his hell-boy diaper days. He rolls it around in his hand, listening. “Did I ever try to stick anything in a socket?” he says, his voice equal parts curiosity and embarrassment. You certainly tried, I tell him. I describe the pins and fingers and various pieces of silverware, and the howling rage that accompanied his frustration at the hands of an impregnable ten-cent piece of child safety equipment. “Did I do anything else?” John asks, sounding a bit like Lon Chaney Jr. struggling to recall a night of mayhem under the influence of a full werewolf moon. Oh, absolutely. I expound on the four different types of cabinet latches we installed to keep him from drinking bleach or eating toilet paper, the drawer locks that kept him out of the carving knives, and the tricky knots we added to his car seat to pin him properly in place, lest he mosey out of the van mid-freeway. And let’s not forget the special handles on the oven to prevent self-immolation or house explosions, the gates to thwart stairwell swan dives, and the inflatable guards we kept on every spigot in the house so he wouldn’t scald himself or ram his head into the bathtub faucet. “Boy, babies can get into a lot of trouble,” John murmurs. I place a hand on his shoulder and nod in my wise, Ward Cleaver way. But I’m not done yet. I tell him about the door locks placed high to prevent street wandering, the yard patrols that kept banana slugs, kitty treasures, and other unwholesome foodstuffs out of his mouth, and the house plants discarded lest he gnaw through the trunk of a poisonous sapling. As a last resort we kept a special medicine on hand to make him throw up anything nasty he swallowed. It was a measure of our parenting skills, I proudly relate, that we never had to use it. “What else?” He’s smiling a bit now, a Dennis-the-Menace-like glint in his eyes. With suitably dramatic gestures I impart the grand finale: the toilet lid latch, put in place to keep him from diving in head first or drinking water out of the bowl. “Gross,” John says, grimacing. “That’s what dogs do.” Dogs, I inform him as our beloved Rosie trots by with a disintegrating tennis ball in her mouth, are like toddlers who never grow up. Then, one by one, the safety gizmos disappeared. John got past the age where he was likely to set the house on fire or go sponge diving in the toilet. The latches and handle covers broke and weren’t replaced, or were simply thrown away by parents grown weary of anticipating every possible disaster. But as he races down the sidewalk my parent brain flips into auto-anxiety mode, thinking of the thousand streets he has yet to cross, the bicycle rides in traffic, the skateboards and rollerblades and, God help me, the child snatchers and the schoolyard shooters. I stick the outlet cover in my pocket and take a deep breath. How could I have known, as I battened down the child safety hatches so many years ago, that those would be the easy days? Anyone who speaks out against recreational trampoline use by kids quickly runs into one major obstacle: the darn things are a lot of fun. Bouncing high in the air, that stomach-flipping weightless sensation, the joy of conking heads with the other three kids boinging along with you…ah, childhood memories! But for too many children those childhood memories include casts, crutches, and stitches–even hospital stays, surgery, and permanent neurologic damage. That’s why the American Academy of Pediatrics recently issued a statement strongly encouraging parents to keep their kids away from trampolines. 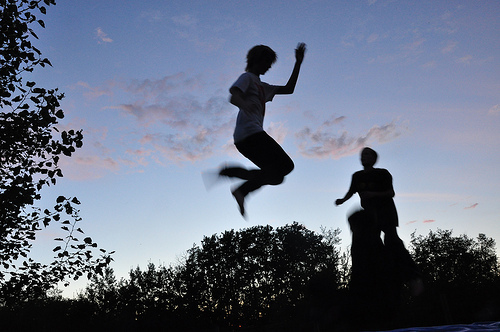 More than 90,000 kids a year end up in doctors offices or ERs with trampoline injuries. Of these, at least a third involve fractures or dislocations of the arms or legs, usually from falls. More than 10,000 children suffer head and neck injuries, typically from falls or failed flips and somersaults. About 4,000 kids a year end up with permanent neurologic damage. Three-quarters of the injuries occur when more than one child is on the trampoline, especially when small children and larger children are on at the same time. 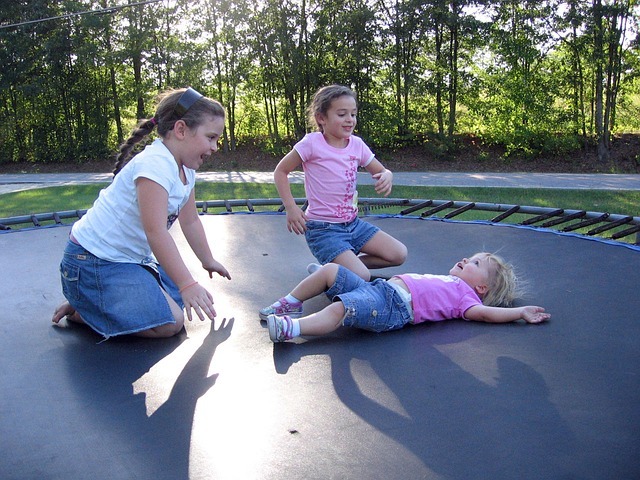 Children 6 years old or younger are 14 times more likely to be injured than larger kids in a shared-trampoline situation. But what about all the safety equipment, like netting and padding and such? Doesn’t that protect them? The safety netting is often flimsy, poorly positioned, and kids often get hurt climbing on it. The pads over the frame and springs can deteriorate rapidly. And no one has shown that these make any difference at all–other than to give everyone a false sense of security. And it is true of trampolines, like so many other modern products, that they don’t build ’em like they used to. The AAP report calls out the trampoline industry for making crummier units these days. Here’s one indication of worsening construction standards: the warranty on a new trampoline was 10 years in 1989. It’s five years today. 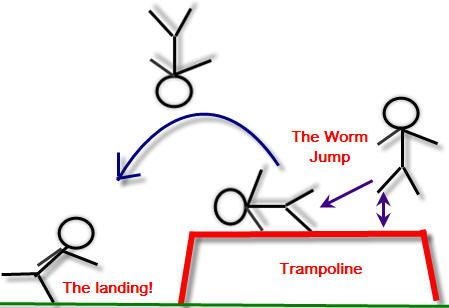 So, my advice: Ditch the trampoline. If parents absolutely can’t bear to part with it, adult supervision is critical. Set the unit up as close to the ground as possible, away from trees, fountains, family heirlooms, cliff edges, etc. Make a one-kid-at-a-time limit, and no flips or somersaults. Photo credits: Roxnstix, Sue Waters, and Pixabay. According to a study in the new Archives of Pediatrics & Adolescent Medicine, one in eight (13%) American high school seniors admit to having used prescription pain medications–like codeine, vicodin, or oxycontin–that were either left over from a previous medical condition or not prescribed for them at all. 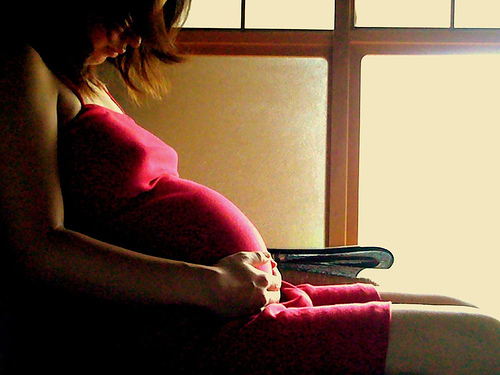 Sadly, some of these teens go on to become drug-dependent mothers, with all the dangers to themselves and their babies that come with addiction. A popular place for teens to find prescription painkillers is in the medicine chest of a grandparent or other elderly person. I often speak to grandparents in my practice, and the discussion about properly disposing of old prescription drugs raises quite a few eyebrows. Narcotic abuse isn’t something most grandparents think about when the think of “childproofing” their homes.